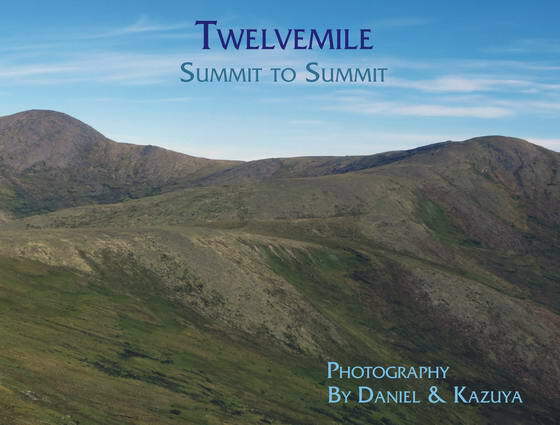 ﻿ "Twelvemile: Summit to Summit"
Please NOTE that this book is available as an 11 inch x 8.5 inch Paperback Edition, and an 11 x 8.5 inch Hardcover Edition. It is not, and will never be, available as a Kindle edition due to the fact that the size is 11 inches in width x 8.5 inches in height. This is a coffee-table book, and additionally, there are 75 photos which spread across facing-pages (2-page spreads). Scroll down for details of each edition. Click on the image to see the covers of both print Editions. When Daniel and Kazuya feel that they need to escape the hustle and bustle, the madness of civilization and society, they pack for the mountains and head for Eagle Summit. It is only a couple of hours outside of Fairbanks, but it is truly remote enough country so that you can easily forget about your computers and cell phones for as long as you want to. If you make it up here to the Twelvemile and Eagle Summit areas then you have left that all behind you. If you’re fortunate, you may be able to see some of the amazing sights which Daniel and Kazuya have taken great pains to photograph and lovingly present to you in this book. No matter where you are in the world you’ll savor this one-of-a-kind armchair adventure through the seasons of the year. Language: English; Color: Full Color with Bleed Link to Amazon.com sales page - Paperback Edition (new window). A Laminated Hardcover Version of this title is also available - details are shown below. Link to Amazon.com sales page - Hardcover Edition (new window). HERE is a PDF file of the 11 x 8.5 inch PAPERBACK EDITION of this book (new window). It is 22.1 MB in size. It's COMPLETE, but Watermarked, secured against printing and PDF'd at the lowest possible quality - all in an attempt to prevent theft. I suggest that you right click on the link and select "Save Link As". Then after it's downloaded to your Hard Drive in a place where you can find it again, open it in Adobe Reader - version 9 or later (very important - it most likely will not open in a version earlier than 9). N.B. When you view the file in Adobe Acrobat please go to the "View" Menu Item and select "Page Display", "Two-Up" and also "Show Cover Page During Two Up". This will allow you to view it as it will appear in print - with odd numbered pages on the right side and even numbered pages on the left. This is critical for this book as there are 75 photos which are 2-page spreads, so if you don't follow the instructions you will not see these as they should be.